Libeskinds academic and intellectual practice culminate in this much-talked-about and unusual building. 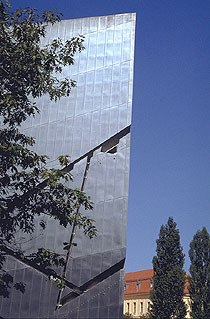 The design is based on a rather involved process of connecting lines between locations of historic events and locations of Jewish culture in Berlin. These lines form a basic outline and structure for the building. Libeskind also has used the concepts of absence, emptiness, and the invisibleexpressions of the disappearance of Jewish culture in the cityto design the building. This concept takes form in a kinked and angled sequence through the building, orchestrated to allow the visitor to see (but not to enter) certain empty rooms, which Libeskind terms voided voids. The ideas which generate the plan of the building repeat themselves on the surface of the building, where voids, windows, and perforations form a sort of cosmological composition on an otherwise undifferentiated, zig-zagging zinc surface. If the intellectual narrative which generates Libeskinds work is complicated and inaccessible to the uninitiated, the building itself should stir emotion in even the most casual visitor. The stark meeting of the zinc-paneled exterior and the sky and the sharp incisions of windows are somewhat forbiddingif beautiful. Take the Ubahn U6 to Kochstrasse, and walk east to Lindenstrasse to reach the Jewish Museum. +49 30 308785 681, or email info@jmberlin.de. 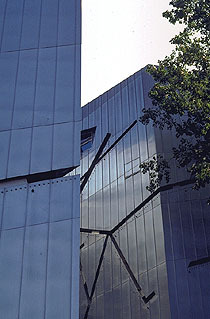 The official web site of the museum at www.jmberlin.de contains pictures and information (in English) on the building as well as the exhibitions and how to visit. Photographs and plans can be downloaded, as well as an essay on the building by the architect. 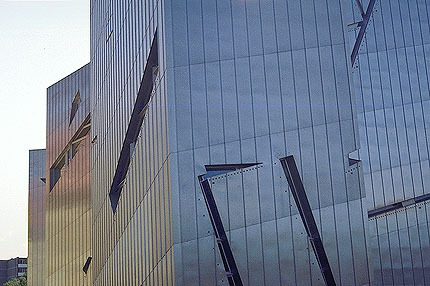 Daniel Libeskind provides his own account of the building and its design at his own web site.